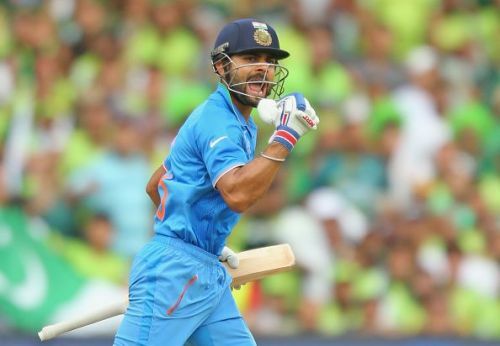 Virat Kohli scripted history by becoming the fastest batsman to scale the herculean 10000- run mark in ODI cricket. Kohli got to the milestone when he reached the individual score of 81 runs during an innings of 157 runs against West Indies in the second ODI at Vishakapatnam. The Indian skipper took only 205 innings to reach the milestone. He became only the fifth Indian and the thirteenth batsman overall to join the exclusive club. He joins former Indian batting greats like Sachin Tendulkar, Sourav Ganguly, Rahul Dravid and MS Dhoni as the highest run-getter for India in ODIs. Virat Kohli has been hailed as the best batsman in white ball cricket owing to his superlative consistency in registering match-winning knocks for team India. The Indian skipper has struck a purple patch with the willow contributing immensely to the success of the Indian team. Kohli has developed a near to perfect batting technique which allows him to dominate the best of bowling attacks in the world. His penchant to score match-winning tons while chasing daunting targets has earned him the title of ‘Chase Master’. The thing which really stands out in Virat Kohli’s batting; is his ability to convert his starts into daddy hundreds. Kohli has all the weapons in his batting arsenal to be hailed as a complete stroke maker. Be it his stable head position, perfect balance and wristly all-round strokeplay- his batting is a master class. Virat is a conventional stroke maker and plays a risk-free game to accumulate runs in the middle order. He also has the ability to step up the tempo with a flurry of shots from his batting arsenal. An intense fitness regimen has kept him injury free for a major part of his career and has helped him endure the grind of playing all three formats of the game. Over the last five years, he has been the leading run-getter for India in ODI cricket and the greatest match winner with the willow. Coming in to bat at number three, Kohli spearheads a potent middle order and builds on the strong platform given by the lethal opening duo of Rohit Sharma and Shikhar Dhawan. Since taking over the ODI captaincy from MS Dhoni, Kohli's batting has gone up a notch and his run-scoring prowess continues to win India matches. The Indian ODI skipper has smashed most of the batting records in his ten-year-old stellar career and is destined to break a few more before calling it a day. The recipe behind Kohli's phenomenal success as an ODI batsman has been a burning passion and never-ending desire to play match-winning knocks for India. So, let us celebrate and have a look at the batting records owned by Virat Kohli in the limited overs format of the game. Virat Kohli: An alien amidst humans!